Specifically designed for the Flutter Butter jar, these feeders provide a quick and easy focal point for any garden. The Flutter Butter jars attach easily with a simple twist. The feeder can be hung on trees or from any support with the chain or can be mounted on a wall or fence via the built-in bracket. This bracket also enables the feeder to be flipped up for easy jar replacements. 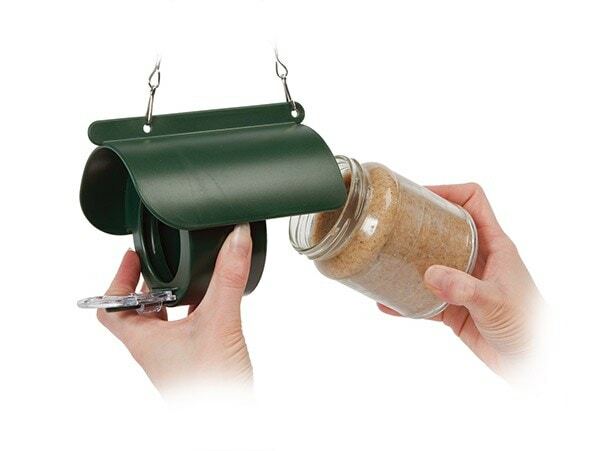 Simple, quick and fuss free, these charming feeders provide birds with an alternative to bread and seed in the garden. Made from tough weather-proof polycarbonate, the feeder can stay in place all year round.